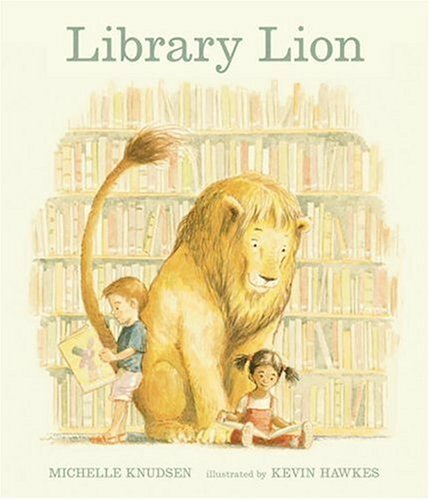 It’s National Library Week , and for me, that means a reread of Library Lion. This book is an excellent pre-requisite for taking a child to the library for the first time. Libraries can be wonderful, fun-filled places, with story hours, colorful children’s sections, and new friends. However, they can also be a bit imposing at times, and this book is sure to put a young reader’s mind at ease. Mr. McBee ran down the hall to the head librarian’s office. “Miss Merriweather!” he called. “No running,” said Miss Merriweather, without looking up. And from that charming beginning, the story continues. After agreeing to not roar in the library, the lion regularly attends Story Time, does all sorts of chores (I love the image of him dusting with his tail! ), and becomes indispensible to Miss Merriweather, causing the patrons of the library to wonder how they ever got along without the lion before. Unfortunately, this incites jealousy in Mr. McBee. His jealousy gets the better of him when the lion roars to let him know Miss Merriweather is in trouble, and he excitedly banishes the lion for breaking the rules. The illustrations are particularly moving in this part of the story, as the lion’s look of dejection when he thinks he cannot return to the library even touches the cold heart of Mr. McBee. The message at the end, that sometimes there is a good reason to break the rules, is sweet as well. All in all, this enchanting tale and warm illustrations ensure that this book will be a classic for years to come.